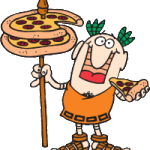 We are heading down the fundraising path again just in time for the SuperBowl with our fifth “Little Caesar’s Pizza Fundraiser” beginning January 2. We need your participation to help make it a successful one! The money we raise will help bring our equipment loan closer to being paid off, plus it will get us a step closer to our goal of purchasing more equipment to aid in the teaching of the preschool, recreational, and competitive programs enabling us to offer the best gymnastics instruction possible. We are hoping that each student enrolled at Gemini can try to sell at least a minimum of 5 items in the “Little Caesar’s Pizza” brochure. As an incentive, any student who sells 5 items will have their name entered into a drawing for a “gymnast inspired” gift basket. If you sell 10 items your name will be entered into a drawing for a new leotard from our pro shop or if you sell 15 items you could win your own private lesson with Coach Amy. Orders will be delivered and must be picked up on: Friday, February 1, 2019 between 3:00 and 8:30 pm. For your convenience, you may place your orders online. It is as easy as 1 – 2 – 3. Go to PizzaKit.com. Click on “Products” then “Shop”. Enter your group’s Fundraiser ID #346583 so they earn the profit on your purchase. START SHOPPING! All products can be shipped directly to you or the group on delivery day. Either way, the profit from EVERY purchase will be sent to your group. this fundraiser a great success!